The apex of Nolan’s career, his $200m dollar sci-fi spectacle Inception, certainly shows his most self-conscious attempts to bring out noir motifs. It is no coincidence that the heist genre has been celebrated in works like John Huston’s The Asphalt Jungle (1950) and Robert Wise’s Odds Against Tomorrow (1958), both of which feature a one last job, as the protagonist Cobb (Leonardo DiCaprio) has here. Nolan certainly shows a craft is subverting some of the main tropes—Cobb’s job is not stealing something but instead putting something inside a vault. Additionally, the significant portion of the narrative takes place inside the psychological plane, where existential fears can manifest themselves into physical threats (the basis of film noir). The central threat, and perhaps the most unique character Nolan has put on screen, is Mal, the dead wife of Cobb (Marion Cotillard). Cobb is overwhelmed by guilt of leading his wife to suicide, one that he feels responsible for enough that she becomes a dangerous and malicious figure whenever he enters the dreamscape. She literally becomes the femme fatale, a dangerous female that is the manifestation of the anxiety of the protagonist. As Mark Fisher notes, she “represents a psychoanalytic Real—a trauma that disrupts any attempt to maintain a stable sense of reality, that which the subject cannot help bringing with him wherever he goes” (42). And while Cobb will admit to what he’s done by the end of the film, he, like all other Nolan protagonists, chooses a subjective reality, in which he remains a hero rather than face the truth of his existence. That final shot of Inception is not about whether the totem falls but the fact Cobb chooses to ignore it—he has decided, like Leonard choosing his to change his reality, or Wayne lying to Gotham, to be a hero in his own subjective world where he remains the good father and the genius con artist than one where he is the bad husband and trapped in his own nightmares. Nolan presents this ending to us in a hopeful, sunlit drenched palette, never allowing his audience to question whether Cobb has indeed “paid” for his sins, only whether his new reality is indeed reality. It is curious then, of all places, that his most non-noir film is the one where he seriously considers the themes and significance of his reconstruction of film noir. The Prestige is Nolan’s only film that tonally confronts the frightening existential questions at the center of such a tradition. 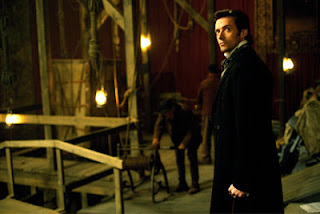 The film follows two rival magicians, Angier (Hugh Jackman) and Borden (Christian Bale), who spend the entire narrative of the film attempting to discover each other’s secrets. The Prestige’s structure is the most curious of all in how Nolan deals with the idea of an unreliable narrator in film noir. The original novel by Christopher Priest was written in a series of diary entries. Nolan takes that idea and shows both Angier and Borden stealing and then reading each other’s diaries at parts of the narrative, leading us into long elaborate flashbacks. However, at the end of each of these, the writer reveals to the reader that he has been purposefully given the diary and tricked into reading it. This means the entirety of the narrative is not only subjective, but also delivered by a narrator with the intention to trick. But what complicates The Prestige beyond its search its doubles and search for truth is its tonal and moral approach to the final implications of its narrative. While we root for Cobb, Leonard, and Bruce Wayne, we remain ambivalent and truly fearful of these two magicians. When it’s finally revealed—Angier has preserved his illusion by murdering himself every night, and Borden has lived his entire life as twins switching places to even his wife and daughter, and this is a secret he’s willing to preserve it to his death—it doesn’t have the astonishing effect that most magic tricks do. It’s instead unsettling and almost horrific to think about. These magicians lie to themselves and their public about their method in order to preserve the spectacle, to remain heroes. Kim Newman posits: “Their characters are monsters whose sole redemption comes in the revelation that each is willing to inflict grievous harm upon himself to achieve the illusion he needs for his act” (19).